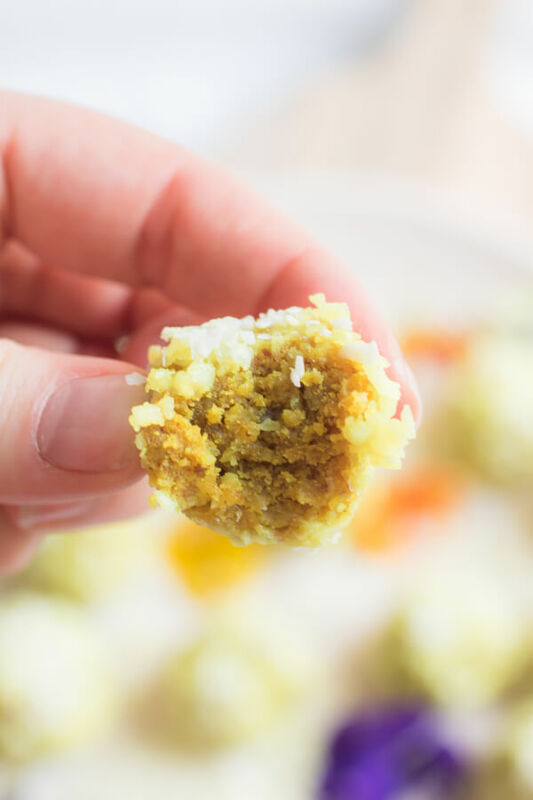 Lemon turmeric energy bites are a seriously delicious (no-bake) healthy snack. One bite of citrus perfection, combining the perfect balance of protein and fat to help you feel full and satisfied. They taste like lemon cake bites, you are going to love them! For this recipe you will need; nuts (I used cashews, walnuts, and pecans but any combination of nuts and/or seeds will work), shredded coconut, lemon juice, lemon zest, turmeric, coconut butter, and protein powder (optional). 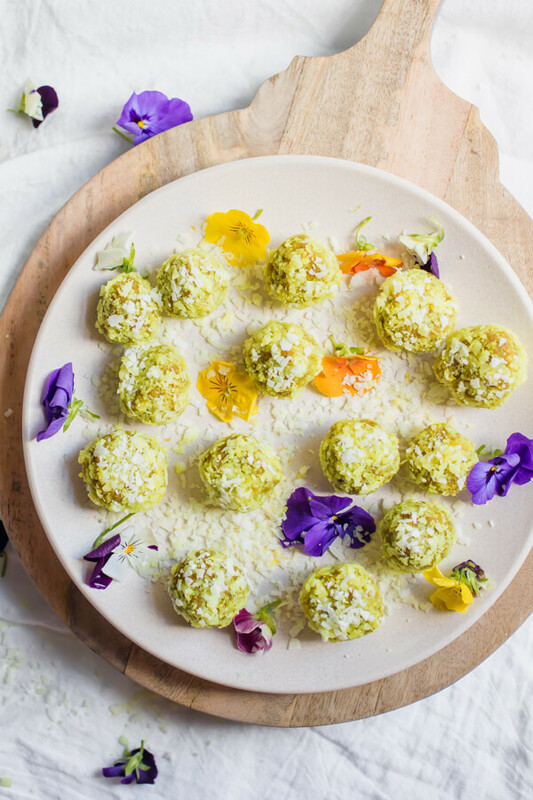 This recipe for no-bake lemon turmeric energy bites was born out of my general dislike for protein bars. I have a ton of clients and friends and family (sis-in-law this one is for you!) that are borderline obsessed with bars. They aren’t my favorite. I do love the convenience, especially when you need a super quick bite post workout or between client sessions. 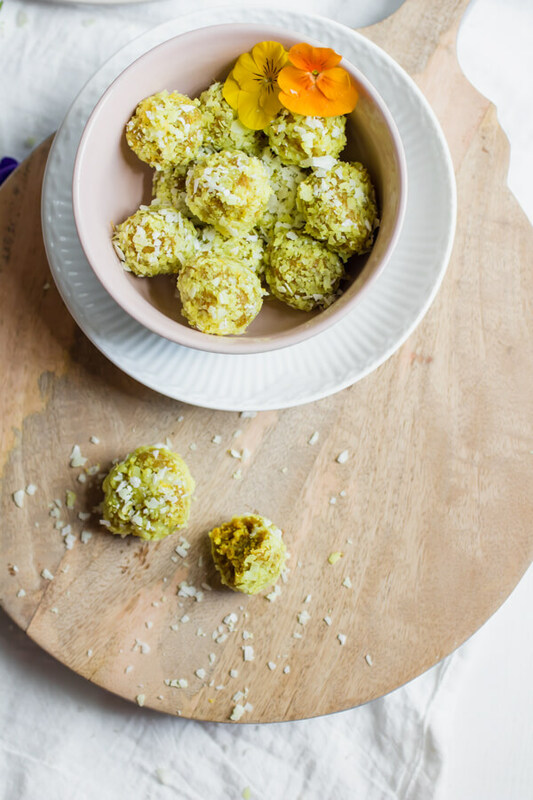 Lemon turmeric energy bites, to the rescue. Far superior to a protein bar, IMHO, but packing all the same benefits. 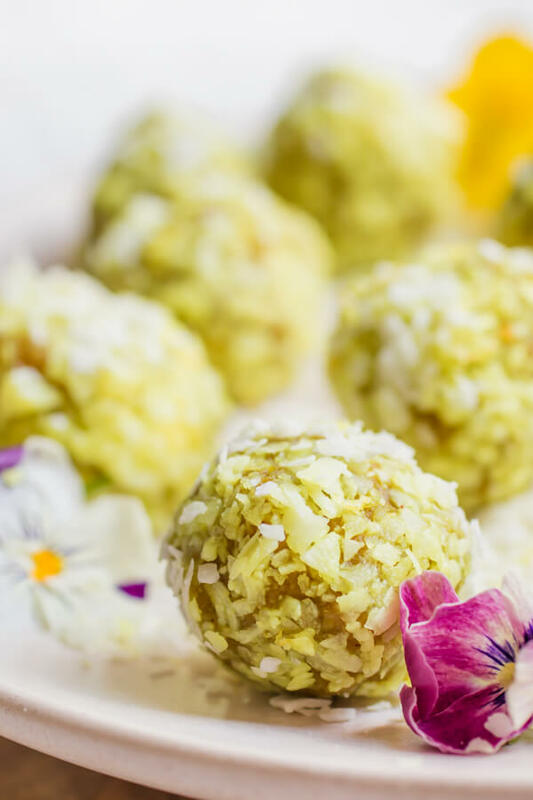 Filled with super healthy ingredients like turmeric, nuts and coconut that boost anti-inflammatory properties and encourage overall health and vitality. These no-bake energy bites are gluten-free, paleo, vegan, and 100% sugar-free. 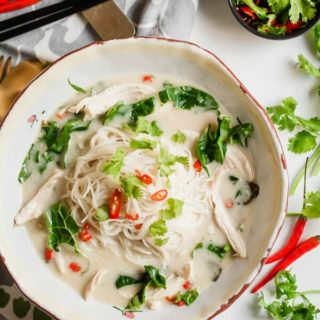 There are only 6 simple wholesome ingredients in this recipe and not one of those is sugar. Not even a natural sugar like maple syrup, honey, dates, stevia, or monk fruit. Instant snacking that’s what this moment is all about. Grab one of these babies and POW! You are instantly revived and ready to rock! Portable, delicious, nutritious, perfectly lemony. What more do you need? Lemon is loaded with vitamin C! Collagen peptides is an excellent source of protein and also beneficial for gut health! All of that goodness plus these little zesty tangy bites are seriously delicious! I made these lemon turmeric energy bites for a recent class I taught called “snack rehab” as proof that snacking doesn’t need to involve sugar. I’m happy to report they were a huge hit! I can’t wait for you to try them. 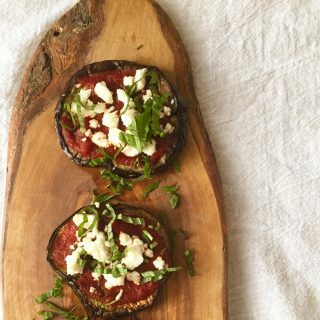 If you do, don’t forget to tag your recipe with #abraskitchen on Instagram! 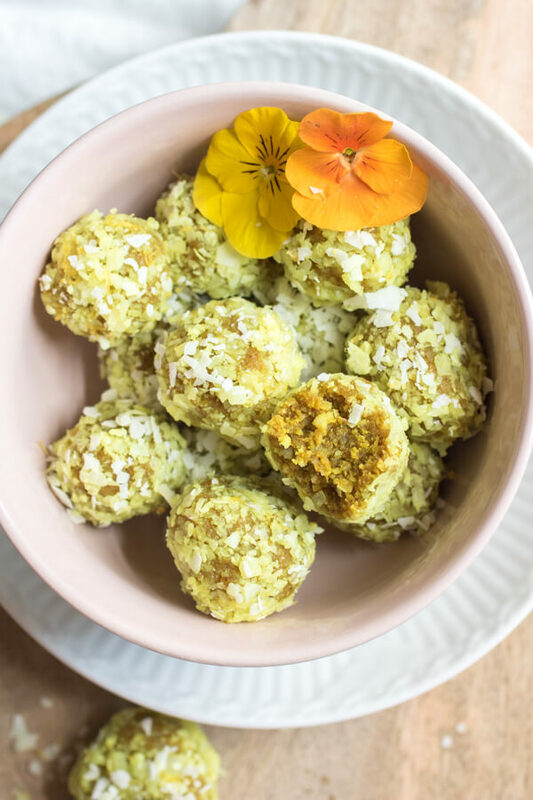 Lemon turmeric energy bites are a seriously delicious healthy snack. One bite of citrus perfection, combining the perfect balance of protein and fat to help you feel full and satisfied. 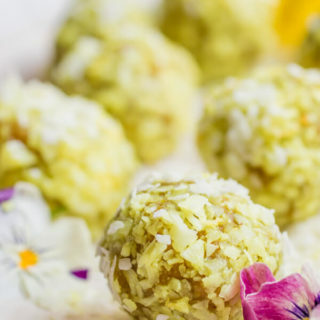 Roll dough into small balls between the palms of your hand, roll in shredded coconut and lemon zest. As you roll dough it will produce more oil, I gently rolled the balls over a paper towel to remove some of the oil and then rolled in coconut and lemon. 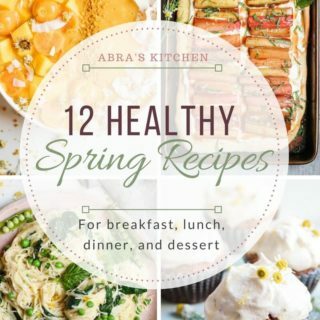 12 Healthy Recipes to Make this Spring for Breakfast, Lunch, Dinner and Dessert! Can fresh turmeric be used? Also, do you have any idea what size a scoop of the collagen peptides is? I don’t buy it, but have seen it in single packets, but they are small…not sure if they are equal to one scoop. I love the flavor idea of these, I’m not a chocolate craving or sweets craving kinda girl, but I do like lemon! Hi Denise, We are lemon loving twins 🙂 You can definitely use fresh turmeric, that would be fantastic! A scoop is around 1.5 tbsp, so 3 tbsp would work. I believe the single packets are equivalent to one scoop, but you can use any kind of protein powder. I just tried a batch with a vegan pea protein that I have and it worked equally well.